eCopy PDF Pro Office... lets you create PDF files from a wide range of file types. The Print dialog box in your print-capable applications will offer a printer named Nuance PDF Create. The PDF Create Assistant lets you compile a list of files generated by different applications. You can also create PDFs from XPS files. Each file can be converted to a separate PDF file, or they can be combined, overlaid or packaged into a single file. When working in Microsoft® WordTM, Excel®, or PowerPoint you can call on the program to create a PDF file directly from your current document. During conversions hyperlinks and comments can be transferred and you can set bookmarks to be generated from the structure of the Word document, each worksheet in Excel or for each slide in a PowerPoint presentation. Document information (metadata) can also be transferred. When working in Microsoft Outlook® or Lotus Notes®, message attachments can be saved as PDF files. As you write a new message or a reply, you can choose a non-PDF file from your computer to have it converted to PDF and attached. The program can create PDF files in versions 1.3 to 1.7 and PDF/A. Files can be protected by passwords and can include watermarks. Compression and font settings give you control over PDF file size and appearance. eCopy PDF Pro Office gives you extensive control over your PDF files through an easy-to-use browsing and reading interface. You can edit pages and documents, annotate and review them, adjust document security, sign your documents and more. PDF documents can be compiled from different sources and pages can be rearranged. The program delivers a powerful document management system: use it to create archives from related documents to index and search them later. Connectors link the program to storage sites in the Cloud for file opening or saving; you can also access different document management systems through the application: use them to store or archive your PDF documents. 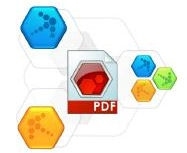 Nuance® PDF Converter 8 lets you unlock PDF and XPS files to edit them as Microsoft® WordTM, Microsoft® Excel®, Microsoft® PowerPoint®, Corel® WordPerfectTM, and generic RTF files. It also lets you open PDFor XPS files directly from these and other applications, edit them and save them in the appropriate file type. It converts PDF files up to and including version 1.7. Encrypted PDF files can be opened if the required password is provided.